August 8, 2017 – Tomorrow, August 9th, Nevada Irrigation District (NID) Directors will meet in a special meeting at 1 pm at their district office in Grass Valley. On the agenda, an item on the consent calendar reads: 2017 Water Storage Investment Program: Adopt Resolution No. 2017-24. Consent calendar items are routine items, like contract renewals, approving minutes of previous meetings etc. They are deemed non-controversial. Consent item 4 is a resolution for an application to receive funding for Centennial Reservoir. Local water needs or conveyance for the Delta? This is the funding NID intends to apply for, with the Environmental Impact Report (EIR) for the project not expected to be available before the end of 2017 or early 2018. 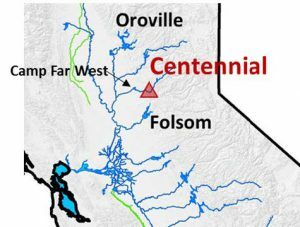 Nevada Irrigation District (NID) is proposing a new storage facility within the Bear River Watershed, called Centennial Reservoir, which is to be used as a part of the Yuba-Bear Project and would have a capacity of approximately 110 TAF. Centennial would be located immediately upstream of NID’s Lake Combie and downstream of NID’s Rollins Reservoir. Figure 34 shows the general location of the proposed Centennial Reservoir on the Bear River. The Bear River system, which is tributary to the Feather River, is “connected” to the upper American River system by canals that convey water between the two basins upstream of Folsom Lake. 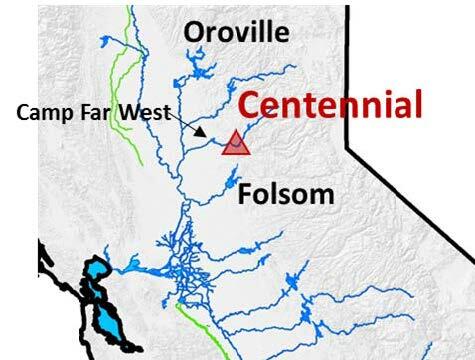 Supply from Centennial may be used to augment American River supplies when Folsom has low storage conditions, and provide water supply reliability to urban water users, while enhancing temperature conditions in the lower American River. Releases from Centennial to the American River may also help conserve storage in Shasta, and contribute water supply benefits to the CVP/SWP system, including in areas that rely on Delta exports. Releases from Centennial may also be used to augment flow in the lower Bear River, below Camp Far West Reservoir, and the lower Feather River. At times when Oroville releases are made to maintain adequate flows in the lower Feather River, Centennial releases may be integrated with Oroville releases to conserve storage levels in Oroville Reservoir. There is an annual average of 260 TAF of surplus in the Bear River. 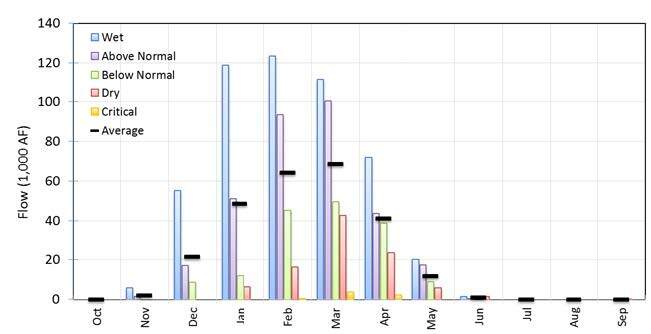 Figure 35 contains average annual Bear River surplus by water year type. There is an average surplus of 7 TAF in critical years, and approximately a half a million acre feet of surplus in wet years. In general, surplus is available in the Bear River system from December through May, with very little surplus available during the summer months (Figure 36). Although surplus is available in the Bear system in most years, there have been periods spanning 3-years when no surplus above what would be stored for local supply was available (Figure 37). There are numerous possible ways Centennial Reservoir may be operated and integrated with operations of existing facilities. For the purpose of this analysis two operational scenarios are used to demonstrate how Centennial Reservoir may be operated with the CVP/SWP system. In both scenarios, Centennial Reservoir operates to augment American River supplies when Folsom carryover storage is forecasted to be below 350 TAF. Releases are made down the Bear River to augment system-wide supply when CVP South-of-Delta agricultural water service contract allocations are below 20 percent. In this analysis, CVP allocations are used as a simple indicator of system conditions, and releases down the Bear River are integrated with both the CVP and SWP and shared among the projects. Releases are only made from Centennial Reservoir when its carryover storage is forecasted to be above 40 TAF. Figure 38 contains a bar chart showing Centennial Reservoir carryover storage, when operated only for NID, with the orange portion of the bars indicating the volume of storage available for use outside NID. Figure 39 contains a bar chart showing Centennial Reservoir carryover storage with system integration; the black points are storage without integration and the blue bars are storage with integration. Figure 40 contains an annual bar chart showing how much water from Centennial is delivered to the American River and how much water is released down the Bear River and on to the Feather. 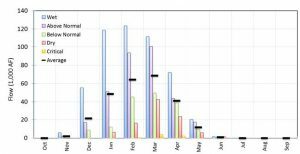 While the average annual release to the Bear and American rivers is 3 TAF each, total annual releases can be as much as 50 TAF, which is significant during critical years. This is an example of why NID needs new leadership, transparent policies and good water management. The question that is never addressed is “Who owns the water NID would impound in this new Reservoir? Under California water law, all of the normal. average water in every Sierra stream or river is owned by someone. Most of the owners are not landowners along those rivers and streams. This dates back to the Gold Rush. 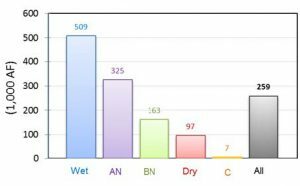 So, NID can only store water in a wet year. 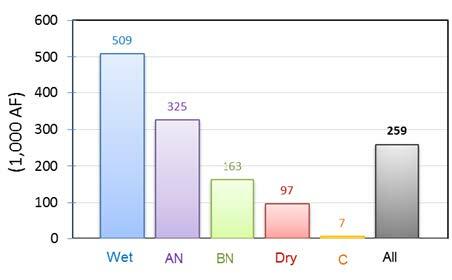 But NID conveniently hides the actual average annual amount of un-owned water coming down the Bear River. NID wants we, the taxpayers and rate payers to fund a very expensive dam. The reality is that impounded excess water will be used to build new subdivisions in the Roseville, Rocklin, Lincoln and Yuba City areas. This dam is not to insure that the residents of Nevada and Placer Counties are protected in drouth years but that NID can service new users in the Sacramento Valley. This study stands in direct opposition to the stated goal and directive passed by the NID Board of Directors August 9th promising that, “No water will be committed out of the NID District” as a result of the application for Proposition 1 funding. It is naive to believe that this Board direction means anything in the face of the corporate interests from southern California and the collusion of their own general manager in producing the study. Additionally, they have given full authority to Rem Scherzinger, who seems to be a driving force in this scheme. “the General Manager of the Nevada Irrigation District, or designee, is hereby authorized and directed to prepare the necessary data, conduct investigations, file such application, execute a funding agreement and any amendments thereto, and sign invoices with California Water Commission.” They seem to have handed this major landscape decision off to a single person who has no roots, connection or commitment to this area. And who was NOT duly elected by the People to make these decisions.